I was recently interviewed by Melissa Dalton at Curbed.com, and our conversation led into a detailed description of how a kitchen really works. Here is the article in its entirety, or click the title to read more on Curbed. Cindy Black, the Austin-based architect of Rick and Cindy Black Architects, married her design expertise with her love of cooking in 2008 when she launched Hello Kitchen. 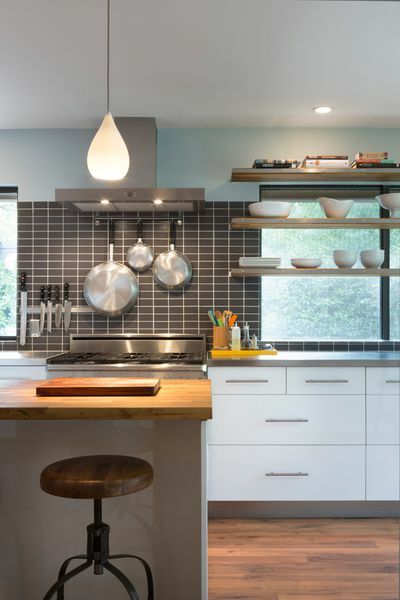 Hello Kitchen’s design team provides personalized kitchen designs for clients, both local and remote, with a “Recipe for Renovation,” which includes detailed schematics that they can install themselves or hire a contractor to implement. To date, the team has completed more than 200 kitchen packages. Here, Black shares the nine essential ingredients to for creating the perfect kitchen. Black starts by evaluating the kitchen’s existing conditions and reviewing certain elements, like doors and windows, which will affect how the kitchen should be arranged. She also reviews how the house is used in general and how the kitchen relates to adjacent rooms. “We start with the as-built plan to take a look at how everything’s working and what’s not functioning very well,” says Black. The new design will address the shortcomings and patterns of use that she finds. Next, she drafts several sketches of very different layouts to see what the client responds to, such as a U-shape versus a galley versus an L-shape. Once the rough layout is pinned down, appliances are chosen, since their dimensions affect counter and cabinet measurements. “They’re the biggest pieces,” she says. “I don’t want that to be a surprise down the line.” Black recommends Bosch dishwashers and the 30″ Big Chill Pro Stove. During layout planning, Black wants to know how her clients cook. “What are you doing in here? How do you work? What’s your morning routine?” Black asks. Some people might not use the cooktop as much as others, or need separate stations for activities like juicing, baking, or making espresso. “All those things factor in towards what counters will need the most bandwidth,” Black says. Since the 1940s, the idea of the kitchen triangle has dominated. The sink, stove, and refrigerator each make up a point of the triangle and should be within a certain distance to one another for efficiency. Instead of a strict triangle, Black thinks in terms of clustering related activities. She suggests that the sink, prep counter, and stove be grouped together, with an optimal run for the prep counter a minimum of 42 inches. “I think you can get too far away, too,” she says, cautioning that eight feet of counter between sink and stove is probably too much. She believes the prep space should only be used for prep activities (such as cleaning food, chopping, and mixing ingredients), have easy access to trash, and won’t overlap with the dirty dish stockpile. She pairs the refrigerator with the pantry for a food storage cluster. “While the sink and range are obviously close together, the refrigerator is going to be a little bit further, usually because it’s such a big element and needs to be tucked away,” she says. She recommends Fisher & Paykel models for their sleek looks and efficient sizing. With the fridge on the perimeter of the action, other family members can get snacks without intruding on the cook’s workspace. In this kitchen, Black installed floating shelves over the window to allow natural light through. The sink and stove elements should be located so that they are protected from main walkways, if possible. “It’s chaos. There’s fire. There’s water. You don’t want little hands in the hot zone,” Black says. “We always prefer daylight whenever possible,” says Black. When she’s organizing the layout, she ensures the kitchen takes advantage of natural light and exterior views. In one of her past kitchen designs, this meant floating shelves across a nearly six-foot window, so that the homeowner could get the incoming light, extra storage, and have easy access to dishes for plating meals. For artificial lighting, Black personally avoids recessed cans, and has purchased products from Schoolhouse Electric and Rejuvenation. She prefers to install alternative styles such as surface mounts, sconces, and under-cabinet strips, aiming for “focused lights in meaningful places.” Installing a dimmer switch ensures lights can be task-oriented, as well as atmospheric. Cabinetry should include both fully-extended drawers and vertical storage. Both have their purposes. “Drawers are awesome for reaching to the back of the cabinet space,” she says, making them ideal for dishes, mixing bowls, and smaller saucepans. “But then certain things don’t work very well in drawers, like baking sheets, cutting boards, and sometimes skillets,” says Black. Deeper vertical cabinets, sometimes fitted with slots, can accommodate more awkward shapes. Take an inventory of your kitchen equipment so you’ll know exactly what you need. Black taps Blum for their cabinet organization systems. When choosing countertops and other finishes, Black likes to get a sense of the homeowner’s housekeeping inclinations, as well as how bothered they are by evidence of wear. “This comes up a lot with marble countertops,” she says. “They will show wear, chip a little bit, and have etching marks. There are certain personalities that are okay with that,” whereas others will want to rip it out immediately. She cautions that despite industry claims, no material will look pristine forever. “There’s no such thing as an indestructible material. Everything will show wear,” she says. “Ask yourself, what do you want to feel and see everyday?” To that end, she likes Fireclay Tile and the wood countertops from Devos Custom Woodworking. Before deciding, always look at samples of the exact items under consideration. Style-wise, Black takes cues from the architecture of the existing house, so that the kitchen “makes sense” with the whole. In a 1950 home that had several red brick walls, Black made sure the kitchen’s finish selections “related” to the existing brick. “The kitchen should have some tie-in so it doesn’t look like it was just dropped from the sky,” says Black. Neither does she believe the kitchen has to “match.” If you’re drawn to a particular trend, think about why you like it and try to adapt the trend to the home’s existing style, rather than just copying it. Black likes to make the dining rooms intimate and suggests oversizing the table. “You don’t want the table swimming in a big room,” she says. Walkways and clearances around the table should be at least three feet wide. Hang pendant lights or a chandelier 30 to 34 inches from the tabletop to create cozy pools of light, and draw diners’ attention to what’s most important: good food and great company.